Your 20s are typically the perfect time to start planning for retirement, but sometimes life gets in the way. What did you do successfully in your 20s, or if you could go back in time, is there anything you would have done differently to ensure a better financial future sooner in life? In a post on Common Core Money, I would love to hear your thoughts on how you could've built your financial safety net in your 20s better--and how you can start it now if you haven't already. What would be your ideal retire at 65 plan? This question was very timely. I kid you not, I was thinking of writing a consolidated post about these two articles: 10 Money Moves You Need to Make in Your 20s and 10 Money Moves You Need to Make in Your 30s, both by Maryalene LaPonsie (what a unique name, no?) at Yahoo Finance, just two days ago when I discovered them. I’m not going to fashion an interesting post about money moves in your 20s AND 30s now, electing instead to deeply focus on my reader’s question. I’d like to start by engaging your mind with a little exercise. From the question above, what are the money matters and issues this reader points out that you would highlight? Were these some you highlighted as well? 1 and 4 both deal with retirement planning and having a framework of action. 2 and 3 deal with decision making now, or at minimum as soon as possible, so that the big overall goal gets met. I would love to be able to give you a cookie cutter response, and be done with it. For example, I could just tell you to Google: “Money Moves to Make in Your 20s,” and send you on your way. Or I could Google this, read as many of the first page (most popular) Google articles as possible, take notes, and paraphrase. That is not me! I was asked for my personal take on this, not someone else’s. Now, what I’m about to share and suggest 20-year-olds do will not all be “money moves.” Most twenty-year-olds I know are playing chess missing their queen and knights. However, if they take heed of what I’m about to disclose, they may be able to one day marry or become a queen, and buy two noble knights. Me in my 20s at Santa Ynez student housing. No doubt full of myself. 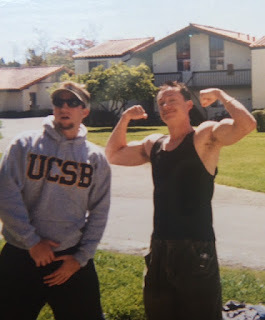 Wasted hours at the UCSB recreation center gettin' buff. Look at my right pocket…that's a pager, remember them? being financially illiterate. I was a money ignoramus. I thought I knew what I was doing, but boy was I ever stuck in The Matrix. I was in college, earning a Bachelor’s of Science in Bio, and then a Masters in Ed. Graduating from the UCSB School of Education in 2001 made me feel on top of the world. I would be set for life working as a teacher, I thought. Stupid me! Sometime around age 25, I realized that I didn’t have a complacency type of personality. Mind you, by Mexican immigrant standards, having earned a B.S. in Bio, a Masters in Ed, and a science teaching credential at 24, no one would ever say I had underachieved! It was this same exact immigrant success drive that kept putting a bug in my ear: it is not enough...there is so much more you can do…so, is this it for you? I was at a Starbucks in downtown San Jose with my ex-wife in 2002, who was also a high school teacher by the way, when a young African-American man in his twenties approached us. He was dressed very nicely, carrying a notebook, and a copy of Rich Dad/Poor Dad by Robert Kiyosaki. He started to talk to us about joining his business. 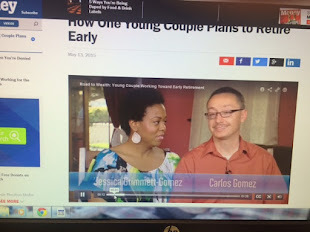 My wife and I looked at each other, a bit embarrassed for this young man (though now it is I who am embarrassed to relate this story to you) for trying to pitch us what I had been programmed to call back then, “a pyramid scheme.” We told this young man (a network marketer) that we were both teachers, as in, leave us alone already, and that we didn’t need whatever it was he was selling. And the young man left, thanking us for our time. I wish I could go back to the young man I was back then, and shake him. Tell him: Carlos, even if you think all is gravy, listen intently to people you think are turkeys! You never know when you may learn something new. If it weren’t for my literary curiosity, I would never have picked-up a copy of Kiyosaki’s best-seller and realized one extremely important thing about myself: I am deep down a member of Camp Wealth, not Camp Rich. Figure out who you are, Spartan or Roman, my Millennial friend! Camp Rich or Camp Wealthy? Start a Retirement Account, Pronto! Do you see now that in order to make your 20s have impact, you need to before anything else, figure out who you are? It makes absolutely no sense to give you cookie cutter advice because whether you like it or not, your future from here on out depends on what you want to see in the mirror at age 65, and smile back at! This is a lot to digest. It’s a huge epiphany of sorts. And it is scary. You may be in college now reading this. Along from having to declare a major, now I’m telling you that what’s even more important is you doing everything in your power to assess your money personality and pick a side. Sure, no one says you can’t switch camps in the future. But because time is of the essence, it is best to discover whether you’re a CR (Spartan) or a CW (Roman) as soon as possible. This is why I recently developed the first ever money personality self-discovery quiz. After completing this short 15 question multiple choice quiz, you will know if you want be rich or wealthy, and whether you're a Spartan or a Roman. You'll also be able to interpret your results from the key and write-up of the underlying characteristics that make a person a Spartan (member of Camp Rich) or a Roman (member of Camp Wealthy). 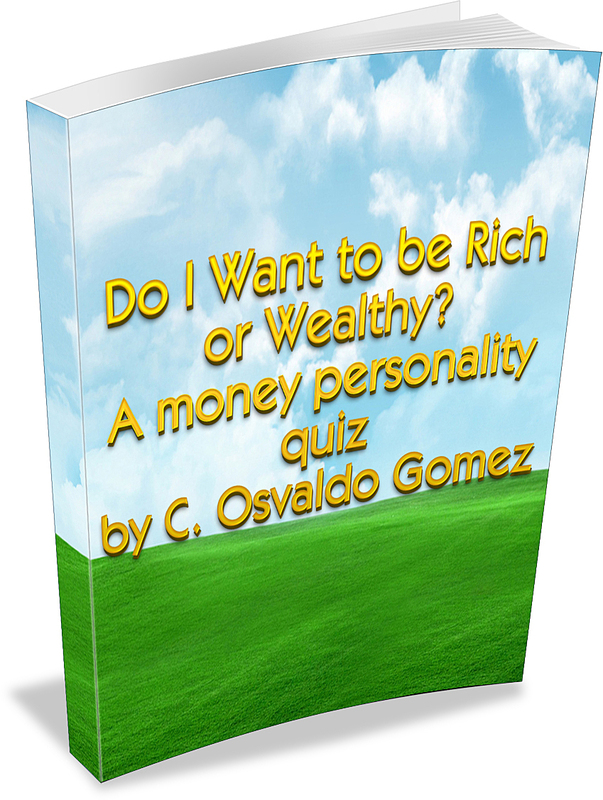 I will send this eBook to you for free when you subscribe to this blog. I discovered I was a Roman at 25 one year into my teaching career, from a chance encounter, and I wish I’d known sooner. I’m going to let you meditate on this and come back to the money moves I should’ve made in my 20s on a later post. Let me summarize the money mindset moves I shared with you using experiential story-telling, in case you missed them. Become financially literate. Read books on securities investing, entrepreneurship, business, real estate, e-commerce, and if you’re really green, on how credit and financing work. Read this stuff like you’re in prison and have nothing else to do. Listen. Stop your yapping and listen! I talked way too much in my early 20s and didn’t listen enough to people. Don’t be afraid to be pitched or prospected by business builders. Even if you don’t think it is for you, you can learn sales techniques, oration, and what is out there that is being offered, from business builders. Be reflective about your money personality. Are you in college and have realized you are really a Camp Wealthy member? Oh boy! Is Camp Rich more like you? Either team is okay; just choose quickly whether you want to battle life holding a spear (Spartan) or a sword (Roman). If you liked reading this, do me the honor of subscribing to this blog. I’ll send you my eBook, CCM: Financial Literacy for Educators and Other Professionals, which tells you what I was up to in my late 20s and early thirties that helped me become the person I am today, PLUS two other eBooks including, Do I Want to Be Rich or Wealthy? Checkmate! our blog giving me nice feedback. This is very effective blog for help me. Please post more related blogs. Thank you for this support.